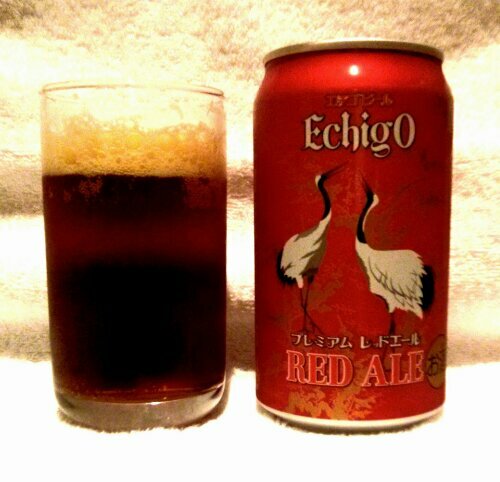 Echigo Beer is based in northern Japan, in modern day Niigata Prefecture although it’s named for the old Province name of Echigo. They were apparently Japan’s first micro-brewery, although Google doesn’t manage to translate much more from their website. Incidentally , of the little it did translate I most enjoyed the health warning at the bottom. “Liquor to deliciously appropriate amount” is a sentiment we can all get behind! This is their Red Ale, a glorious looking beer that comes in what appears to be a national standard 5.5% ABV. The picture doesn’t quite do it justice, as it’s a lighter, more obviously red colour than it suggests. The nose is rich and sweet, with toffee blending enticingly with strawberry fruits. Toffee is the first impression in the mouth too, with tarter red fruit than on the nose, perhaps redcurrants. The body is surprisingly light, and while there’s not a great deal of bitterness, the hops bring a very pleasant tannic edge to the finish – it’s just a shame that finish is a little short. A pretty tasty ale, that deserves 3 stars – I shall be on the look out for more Echigo beers.